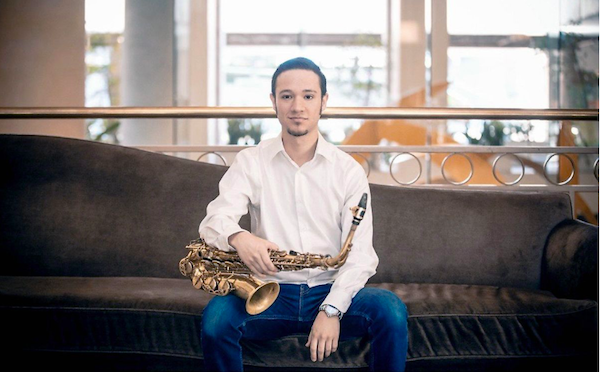 Saxophonist, instrumentalist, educator, producer and composer Danny Janklow is gaining international recognition for his soulful and innovative musical voice. His heart-felt, passionate, and highly energetic music has reached and inspired thousands of listeners from Japan to Holland to Mexico. His live performances, often described as “emotionally charged” and “vibrant celebrations,” leave his listeners always wanting more. Danny has enjoyed the pleasure of sharing the stage and recording with the likes of Stevie Wonder, Kendrick Lamar, Herbie Hancock, Wayne Shorter, George Benson, Jose James, Wynton & Branford Marsalis, Benny Golson, Eric Reed, John Beasley, Ben Williams, Jason Moran and Savion Glover. Saturday, Jan. 12, 5 p.m. 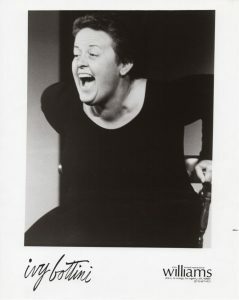 This WeHo Reads event highlights the new book “The Liberation of Ivy Bottini, A Memoir of Love and Activism,” featuring a conversation between feminist, LGBTQ activist and West Hollywood icon Ivy Bottini and her biographer, Judith V. Branzburg. Colorful, charismatic, magnetic, brilliant are just a few of the words used to describe Ivy Bottini, a woman who was at the forefront of the NOW movement and the second wave of feminism. She helped found the New York City chapter of the National Organization for Women and in 1969 designed the NOW logo that is still used today. She moved to L.A. County in 1971 and became an activist for many LGBT causes, co-founding the Coalition for Human Rights, the Los Angeles Lesbian/Gay Police Advisory Board, AIDS Network LA and AIDS Project LA. Her stories of transformative personal growth, sacrifice and activism are not only inspirational and educational, but also a model for activism from a leader in two of the most important liberation movements of the past half century-women’s liberation and gay and lesbian liberation. A book signing will follow, with books available for sale by Book Soup. 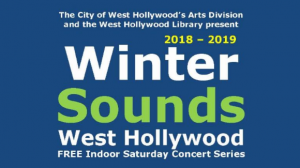 The event is presented by the City of West Hollywood’s Arts Division and sponsored by the city’s Lesbian Speaker Series, ONE National Gay & Lesbian Archives, the L,A. LGBT Center – Senior Services, Hollywood NOW, and the June Mazer Lesbian Archives. 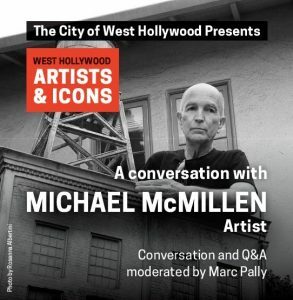 Wednesday, Jan. 16, 7 p.m.
Michael McMillen is an internationally recognized sculptor, installation artist and short filmmaker from Los Angeles. He recently completed a permanent public art work for The Lot (1041 N Formosa Ave.), a historic, full-service studio for TV, film, and commercial production. “Back Lot,” located along Santa Monica Boulevard near Formosa Avenue, acknowledges West Hollywood as the site of one of the earliest studios in operation and its continuous service to the industry to the present. It is a celebration of the mythos of movie making and a tribute to the creative genius “behind the scenes” and in garages everywhere. The art work was commissioned by The Lot and is the newest addition to the Urban Art Collection. Wednesday, Jan. 30, 6:30 p.m. 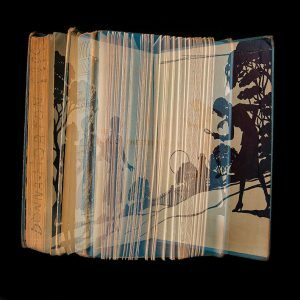 In an age when technology is slowly replacing the tactile experience of reading a book, Ellen Cantor’s work recalls and celebrates the joy of losing oneself within the pages of a favorite childhood tale. Her project, entitled “Prior Pleasures,” is deeply influenced by her love of literature. This series explores memory and preservation of the past while ensuring the creation of a visual legacy for the next generation. The books photographed for this series are the ones she carried with her since childhood. Her mother read them to her and, in turn, she read them to her children, carrying on a tradition of the written and spoken word. Prior Pleasures is created using a multiple exposure technique (without Photoshop.) She photographs the end pages, illustrations, and text. This process allows her to show the excitement of a book fluttering open and coming to life for readers of all generations. Rediscovering these books led her to realize the power and value of the hands-on experience of reading. As she documented each volume, she was transported to a time and place that allowed for imagination and fantasy. With this series, she examines what it is that we remember and how we honor objects that inspired our early creative thinking. Ultimately, Prior Pleasures is meant to remind us that books can excite and enrich our lives. Looking forward to more art and civility and fewer harangues by anyone and everyone.